I 'll admit it: I 'm a victim of (fellow blogger) peer pressure. You see, when The Gloss Goss, Lipglossiping and London Makeup Girl rave about a brand, you don't have any other choice but to try it. 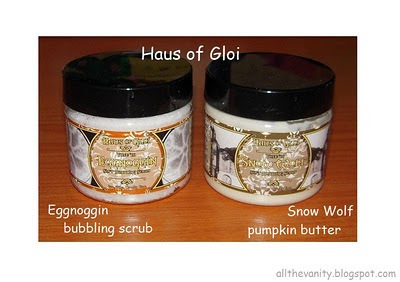 I 'm talking of course about Haus of Gloi, a brand dedicated to making 100% vegan and cruelty free home-made bathing goods, from soaps and scrubs to perfume oils and body lotions. For starters, I chose 2 sample size jars from their Yuletide '10 collection, Eggnoggin Bubbling Scrub and Snow Wold Pumpkin Butter, as it would be pointless to get the full sized products without knowing if I 'd like the scents first. Note that Haus of Gloi sample jars are 56 gr. each, which is more than enough to see if you 'd like them. Personally, I 'd classify these as deluxe/travel size containers. Eggnoggin is described as "The Haus 'nog! Cream, sugar and a shot of dark rum topped with fresh grated nutmeg". At first I was afraid this was going to be a very sweet scent, more than I could handle. Thankfully, that wasn't the case. Granted, it is sweet, but not overly so, and when applied on the skin the scent becomes milder compared to what you smell when you open the jar. Eggnoggin to me is like a cross between Baileys cream licqueur and good old bubblegum, foody, but extremely pleasant. I can see myself using this up in no time. Snow Wolf is a bit more complex. Haus of Gloi's description: "Bristling and prowling, lonesome and haunting. Three howling firs, whitened frankincense, vanilla bean husk, tainted by droplets of blood cedar". From what you can imagine, it's extremely rich and woody, due to the fir and cedar and quite strong, thanks to the frankincense. It's quite a masculine/unisex scent - and oddly reminds me of my grandfather. However, it transforms almost completely when applied, the woody notes are hugely toned down to give their place to a gorgeous soft mix of frankincense and vanilla. I 'm very glad that it changes to that with my body chemistry, since I found the initial...alpine forest impression a little overwhelming. Of course perfume is completely subjective, you have to try it to see how you feel about it. Perfume aside, it would be a mistake by me not to mention that the formulas are amazing! The bubbling scrub provides a gentle, yet effective exfoliation, while it lathers, leaving your skin extra clean and smooth and the pleasantly lightweight pumpkin butter keeps even dry skins like mine well moisturised without unpleasant stickiness (personally, I've placed these right up there with my Korres ones and you know how much I love those). The Yuletide collection will be up until the 7th of January, so hurry up and make the most of it while you can! Me, I 'm already waiting for a little Hearth and Parkin to come my way! What's your experience with this brand if you've tried it? And where do you stand on foody, sweet and woody scents? Great review! No I haven't heard of Haus of Gloi before...mmmm but Eggnoggin sounds good. I LOVE egg nog. I'm not so sure about something very woody though...although my favourite evening perfume is Armani Code and it does have sandalwood in it. So idunno. I actually make my own body scrub with sugar granules and baby oil. Works like a charm :) Have you tried to make your own body scrub before? I like foody and sweet scents, but generally only in shower gels, body scrubs, etc...a.k.a. stuff that will wash off ;) There are certain things that I love the smell of, but don't want to smell that way the whole day..if that makes sense! And I admit, I do not like woody scents! Or at least I haven't found one I like yet. Like them on others, but my bod doesn't enjoy them so well I guess. The Snow Wolf Pumpkin Butter sounds amazing! The packaging always get me too...so cute. I love foody and sweet scents!Love cupcake and vanilla and lollipop scents.Le sigh! @Arietta: Thank you girl, I find describing scents can be very difficult, since you cannot really make the other person smell what you smell through a written page - without taking into consideration that we all perceive scent in a different way! @cbsg5861: I 'm really curious about Absinthe too, hope it smells like the drink! I guess we'll find out at a future purchase! Lol!